The Pineapple Upside Down Cake, which was so popular in the 1950s and 1960s, is again gaining in popularity. No wonder – it is still delicious and wonderful! Use your old cast-iron frying pan when make your Pineapple Upside Down Cake. The heavy steel pan keeps the butter from burning and the handle makes it easy to flip the cake upside down when it is done. History: According to most historians, the late 1800s were when the term “upside down cake” first began appearing. Up until that time, this type of cake was referred to as skillet cakes. This was because ovens have not always been common or reliable, skillet cakes were born of practicality. Cakes were made in the popular cast-iron skillets on top of the stove. Inverting a cake to reveal a topping was very popular as far back as the Middle Ages.The first upside-down cakes were not even made with pineapple, but with seasonal fruits such as apples and cherries, as the canned pineapple had not been invented yet. Canned pineapple manufacturing didn’t begin until 1901 when Jim Dole established the Hawaiian Pineapple Company (now Dole Company) and began producing and marketing mass quantities of canned pineapple. In 1925, the Hawaiian Pineapple Company sponsored a contest calling for pineapple recipes with judges from the Fannie Farmer’s School, Good Housekeeping, and McCall’s Magazine on the judging panel. It is said that 2,500 of the 60,000 submissions were recipes for pineapple upside-down cake. The company decided to run an ad about the flood of pineapple upside-down cake recipes it had received, and the cake’s popularity increased! 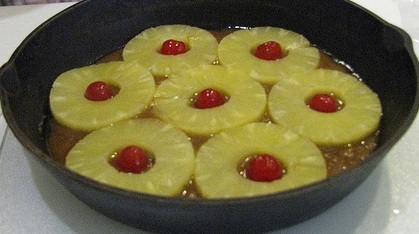 Pineapple upside-down cakes began appearing in magazines, cookbooks, and advertisements. In 1927, a booklet was published called Aunt Sammy’s Radio Recipes, Developed by the Bureau of Home Economics, U.S. Department of Agriculture, and written by Ruth Van Deman and Fanny Walker Yeatman. The booklet was a compilation of 70 menus and about 300 recipes broadcast from October 1926 to June 1927 in the “Housekeepers’ Chat”programs of the radio service. Learn How To Season A Cast-Iron Pan. Check out the Basic Rules For Baking or here for Secrets of a Successful Cake. Also check out more great Cake Recipes and Cast-Iron Cooking Recipes. Prepare Pineapple Topping (see below). In a large bowl, combine flour, sugar, baking powder, and salt. Add egg, milk, and vegetable shortening; beat 2 minutes. Add reserved 2 tablespoons pineapple syrup, lemon zest, lemon juice, and vanilla extract; beat 2 minutes. Pour cake batter over prepared pineapple slices in the frying pan, spreading evenly. Bake 40 to 50 minutes or until a toothpick inserted in center comes out clean. Cake is done when the internal temperature registers approximately 190 to 200 degrees F. on your cooking thermometer. Remove from oven and cool 5 minutes on a wire rack. In a 10-inch cast iron frying pan or a 9- by 2-inch cake pan over low heat, melt butter. Stir in brown sugar until well blended. Remove from heat. Drain canned pineapple, reserving 2 tablespoons pineapple syrup (for cake batter). Arrange drained pineapple slices onto top of sugar mixture. Place a maraschino cherry in center of each slice. Sprinkle with chopped nuts. Set aside until ready to pour the prepared cake batter on top.